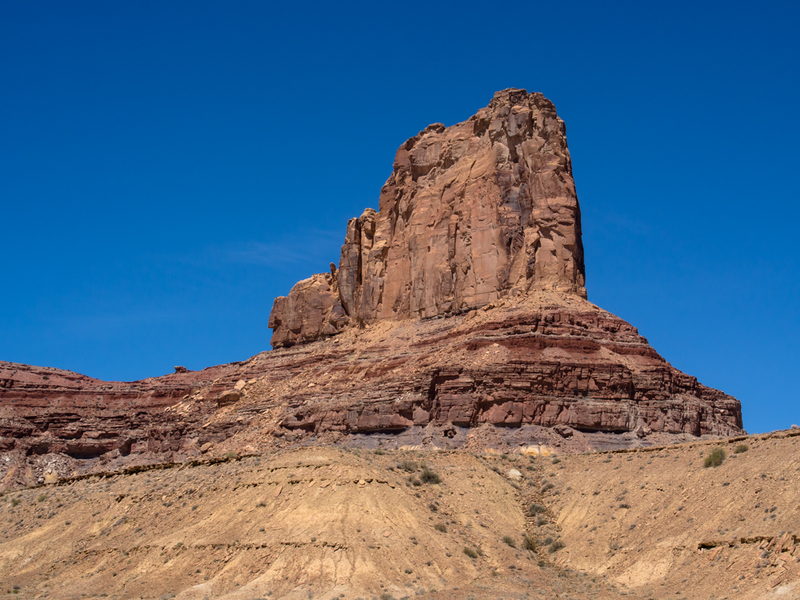 We spent the night near the boundary of the Goblin Valley State Park. 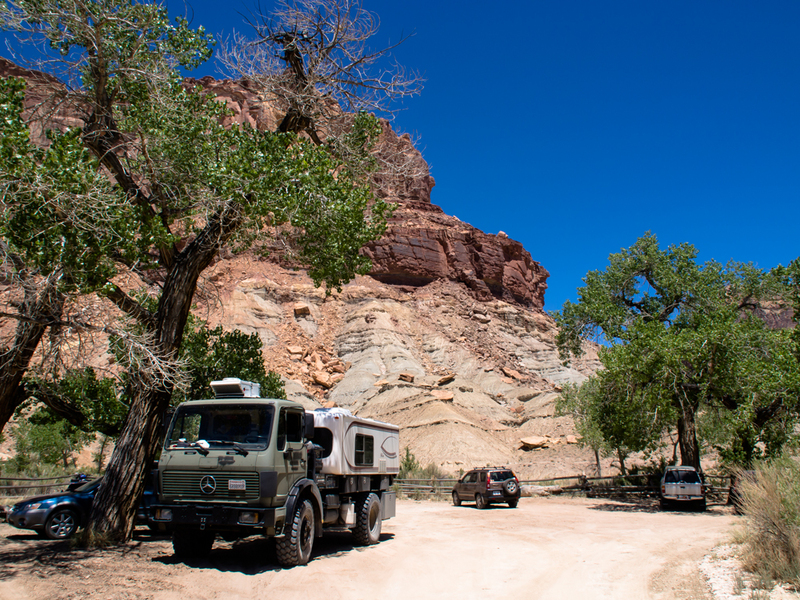 The park was full, so we retreated to a side road on BLM land and found an isolated canyon for our camp. 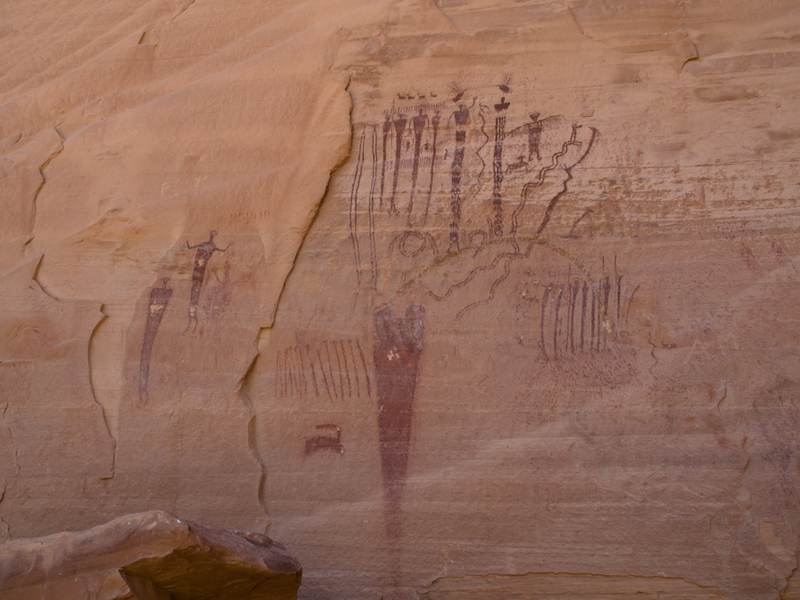 Since it was Memorial Day weekend, there were plenty of folks out and about and we had many vehicles do a turn-around on our canyon. One late arrival decided that our spot was the least bad of the other alternatives and set their tent up quite close to us. But, since we were leaving the next morning, we ignored them. 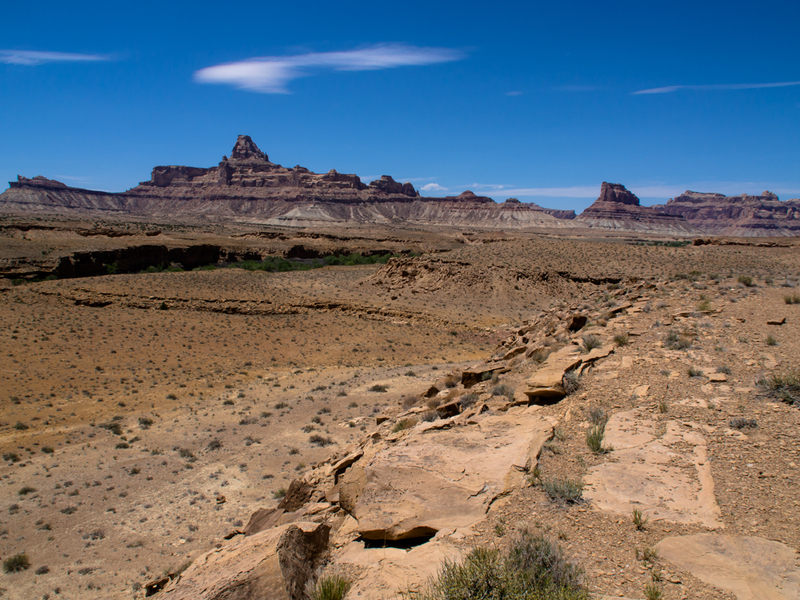 From Goblin, we headed north on the dirt toward the San Rafael Swell and then to the Book Cliffs outside of Price, UT. 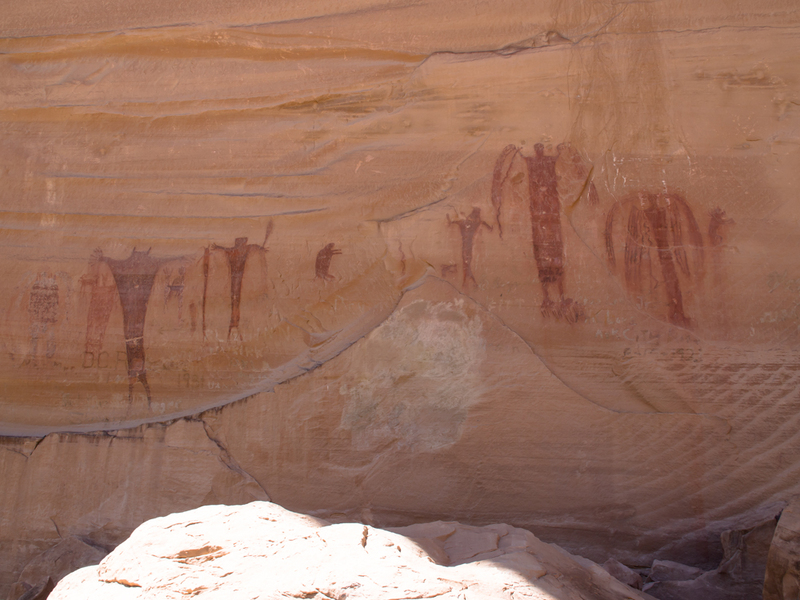 Our camp was in a small side canyon that had interesting wind erosion in the canyon walls. Looking to the west from a ridge above our camp. 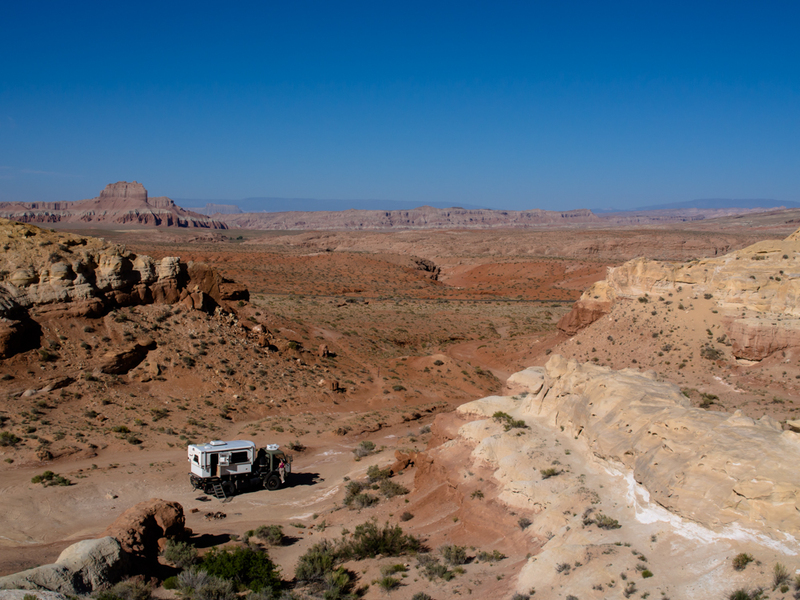 We broke camp and headed north on the dirt toward I-70 and the San Rafael Swell. We saw many folks as the road is good and frequently graded. Every SUV was outfitted straight out of REI with Yakima roof boxes and bike racks. They were all in tents which was sad for them because the wind was blowing hard and sleeping in a flapping tent is next to impossible. 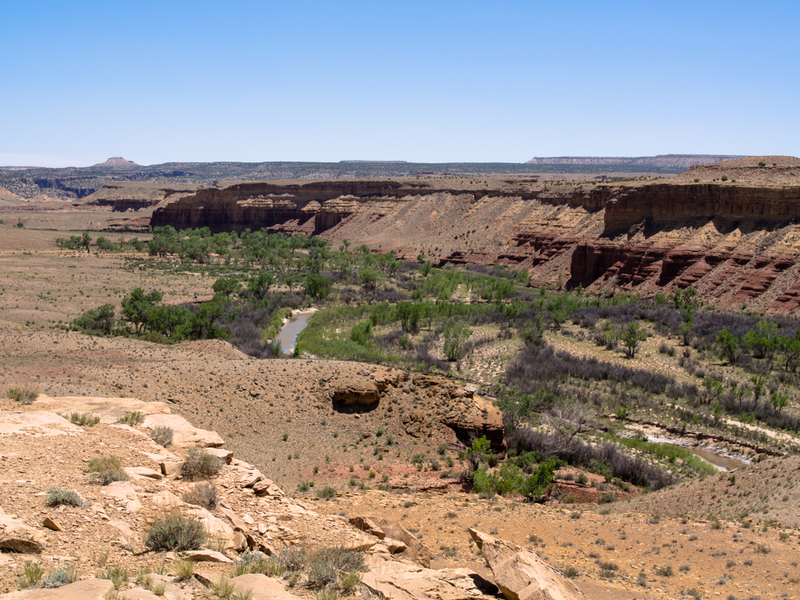 North of I-70 we continued on the dirt to Buckhorn Draw and the San Rafael river valley. 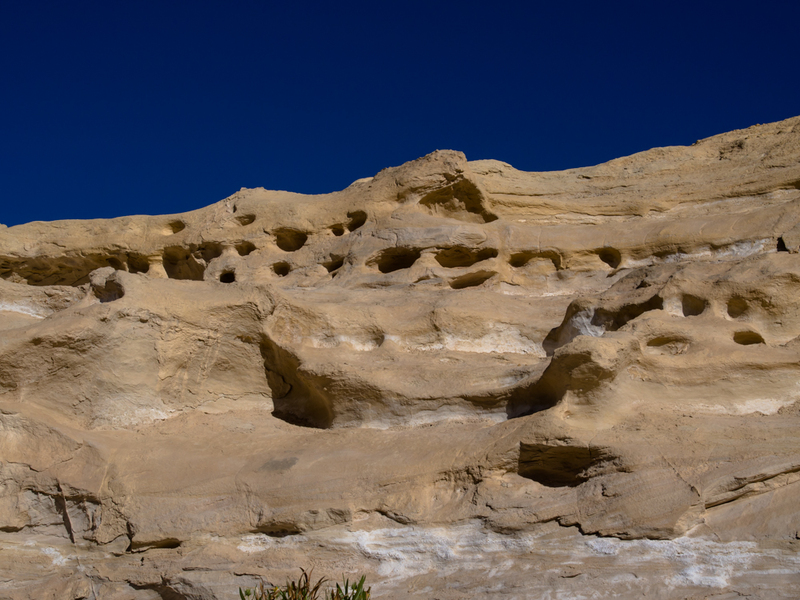 There were many interesting formations along the route. 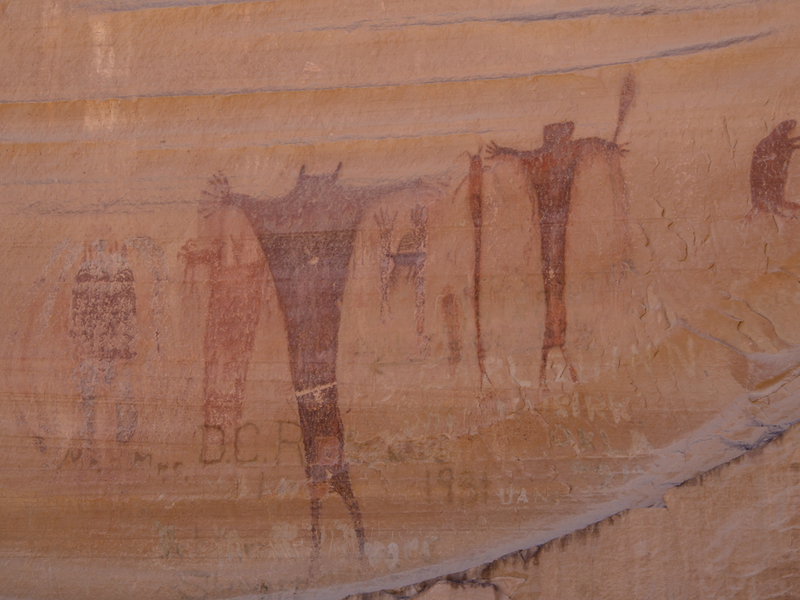 This formation was named "Bottleneck Butte". 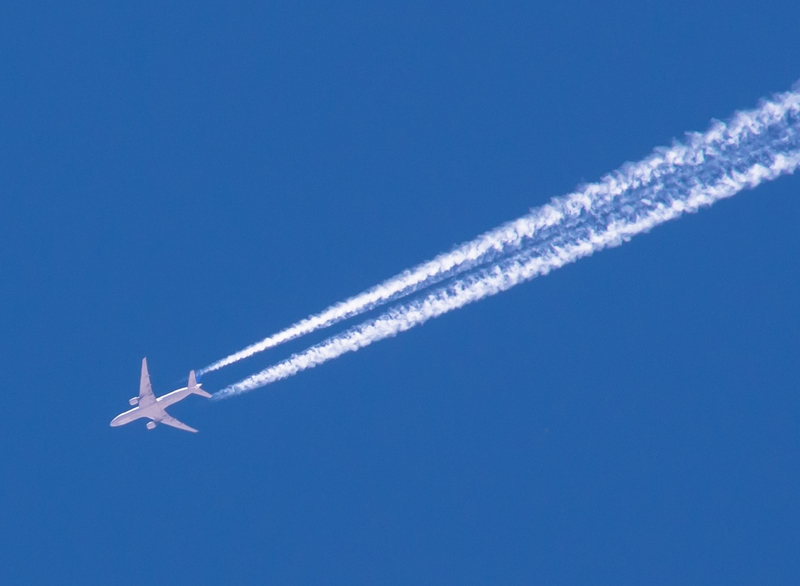 A commercial airliner crossed the skies at 30,000 feet making nice condensation trails. 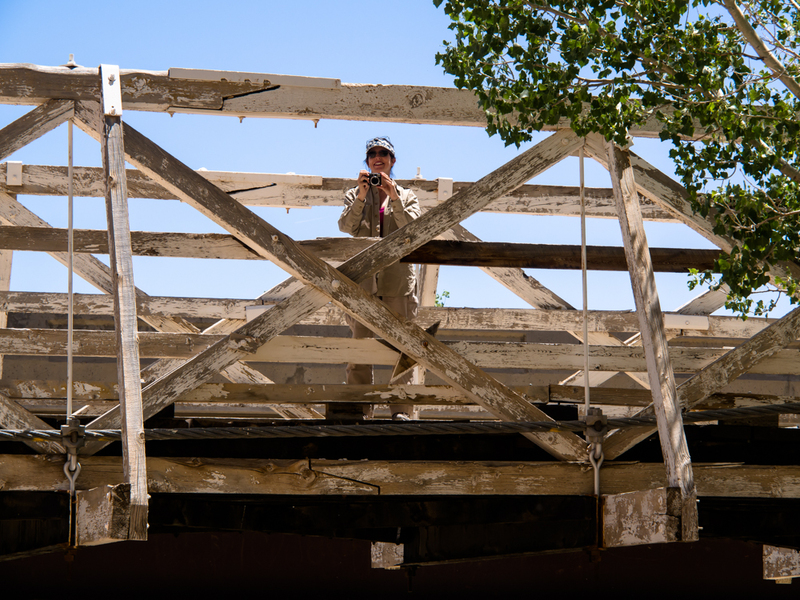 There was a small parking area next to the San Rafael river so we decided to check it out. Back in the 1930s, the only way to cross this river was via a ford. When the water was high, you were essentially stranded on your side until the waters receded. 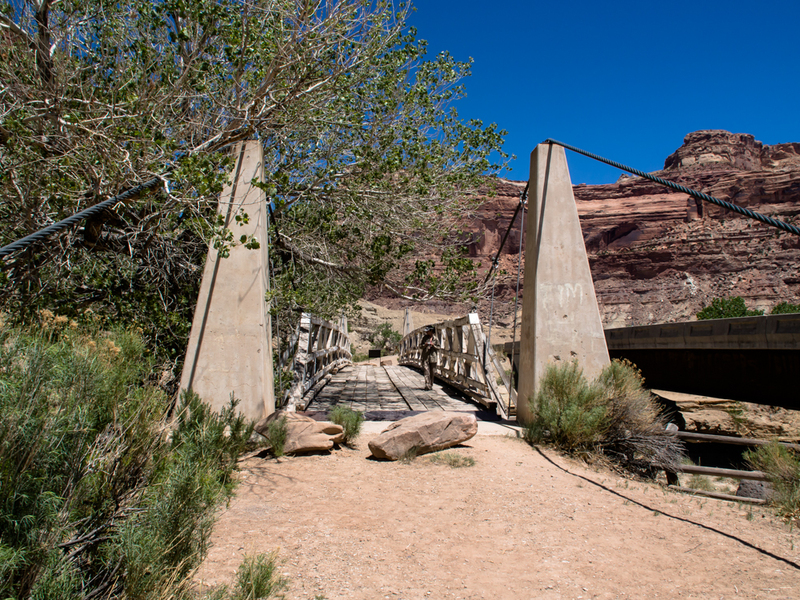 This historical bridge was built in the 1930s to service the ranchers in the area. 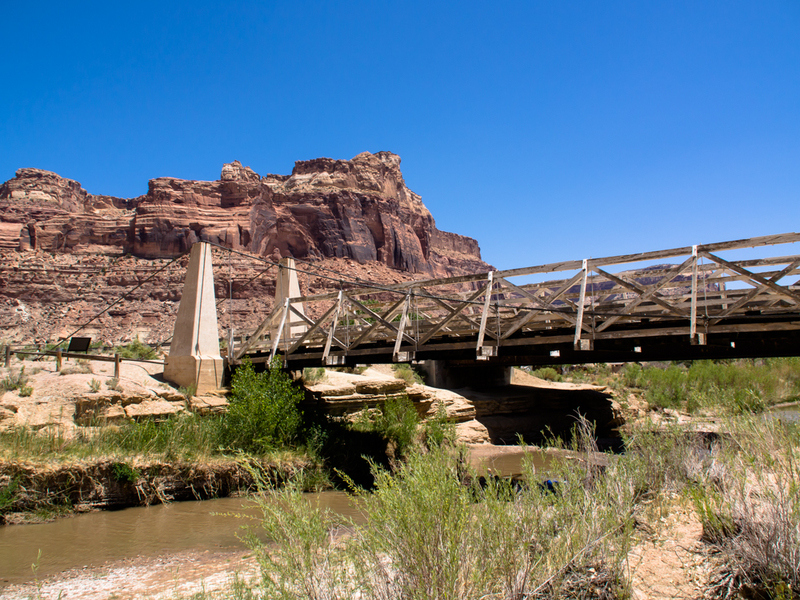 The bridge was flanked by huge sandstone cliffs left by the erosion of the San Rafael river. Kathleen wanted to take a photo of me taking photos. Note the timber structure of the bridge and the support cables. 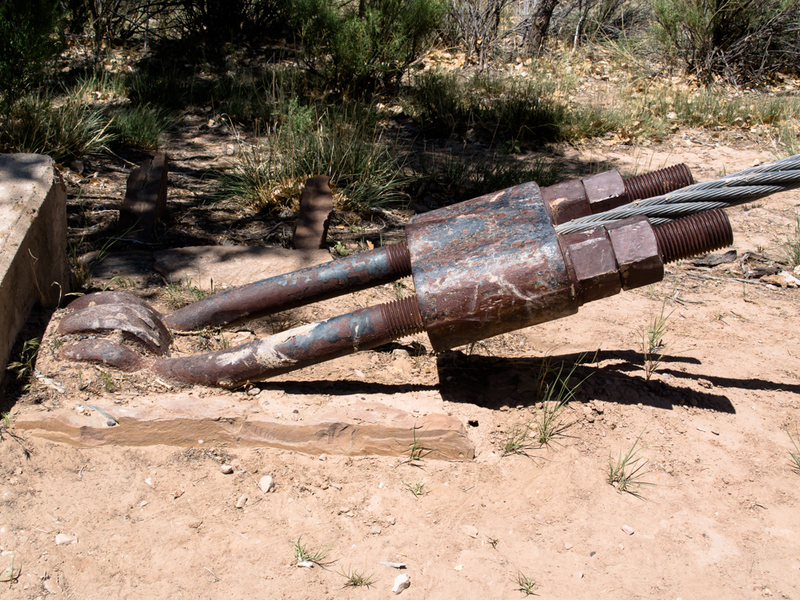 The side anchors were huge iron castings with a beefy tensioning system. Even when new, I doubt that this bridge could support Thor's 20,000 weight. A BLM ranger flagged us down and wanted to check out Thor. 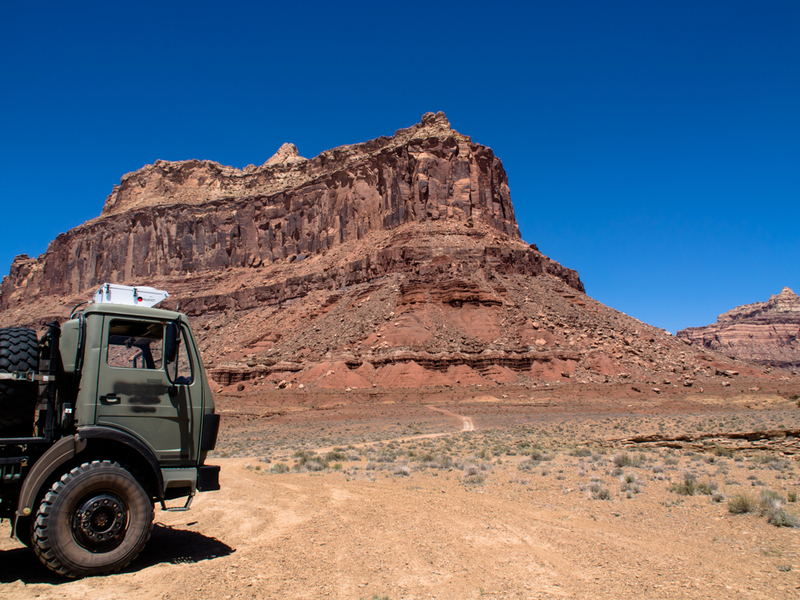 He asked if we had been to Overland Expo in Flagstaff and generally wanted to see the truck. Then, he led us to an area where he thought we could camp. It WOULD have been a nice spot on the river, but was occupied due to the Memorial Day weekend. And so were all the other spots. So, we drove down the river road and took photos and then decided to head north. It was early in the day for making camp anyway. Above is a shot of the San Rafael river valley a few miles east of the historical bridge. 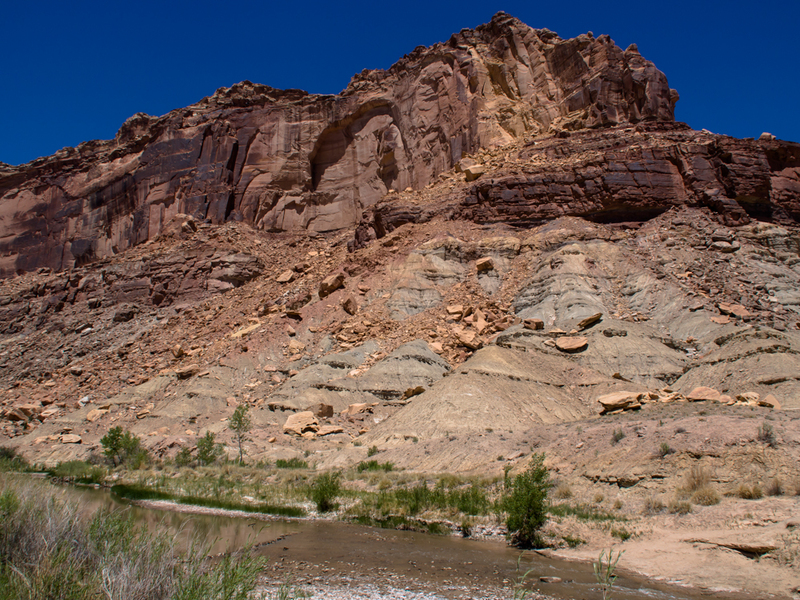 Further down the river road we got nice views of the surrounding cliffs and formations. 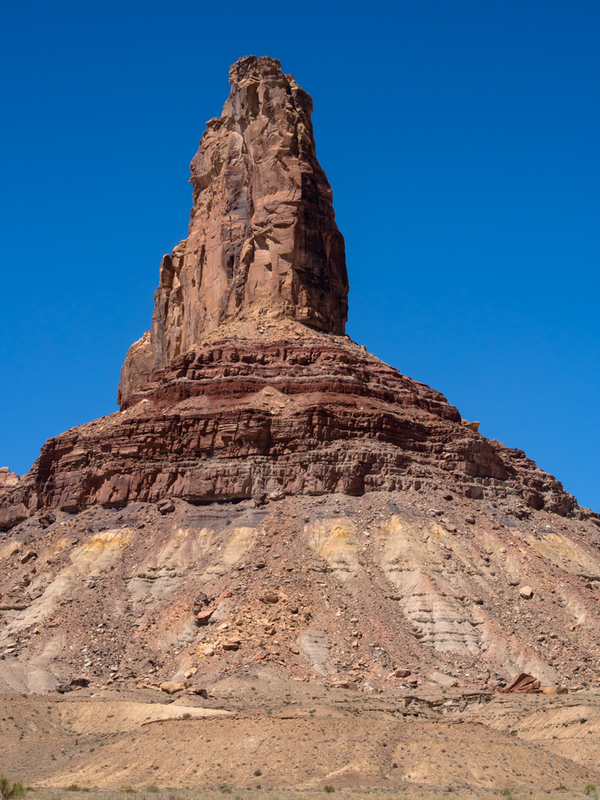 This was a massive structure and dominated the entire valley. Thor was liking the road and surely he enjoyed the view as much as we did. 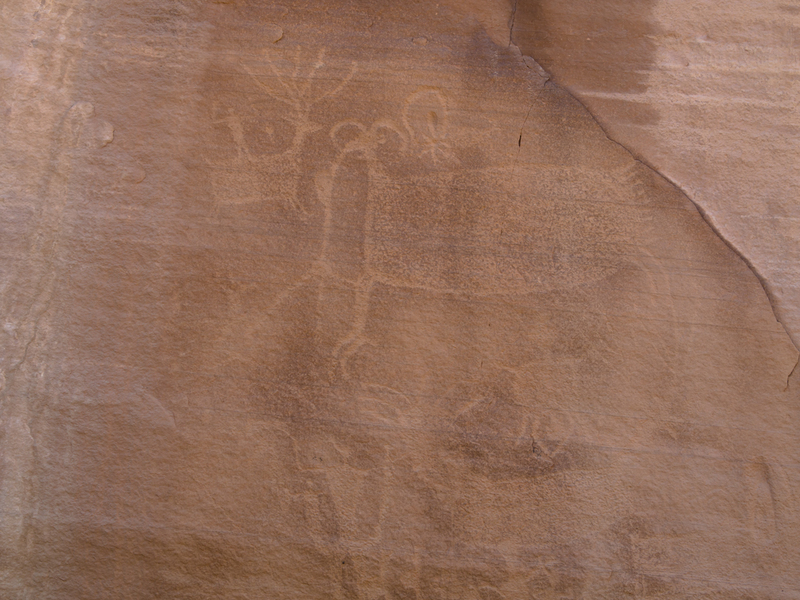 Further north up Buckhorn Draw we came to a large petroglyph panel at the bottom of the canyon. 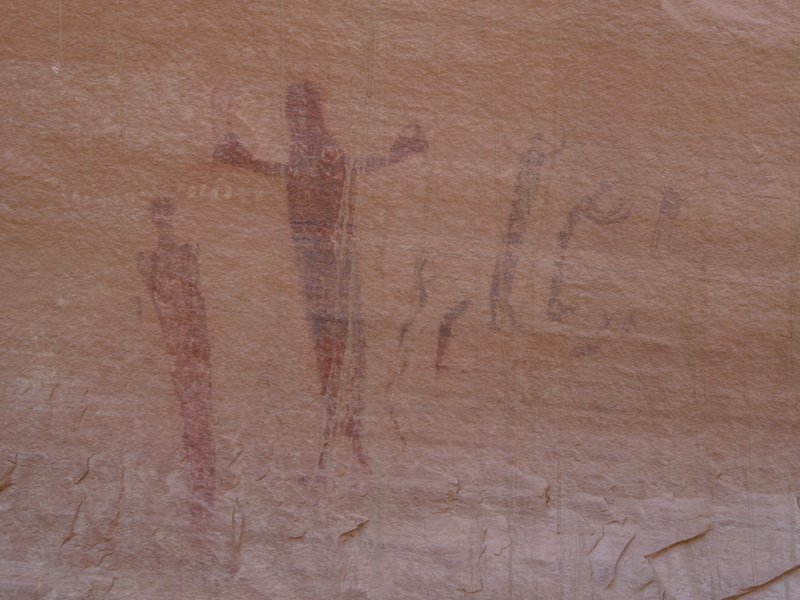 There were several styles of art depicted on the panel. 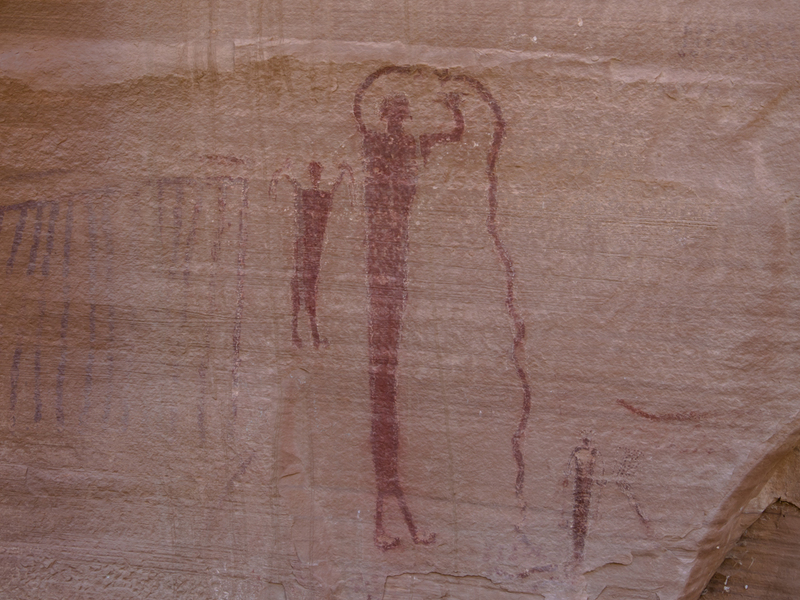 The photo above shows the "pecking" style where a sharp, pointed rock is used to peck holes into the wall to form the image. 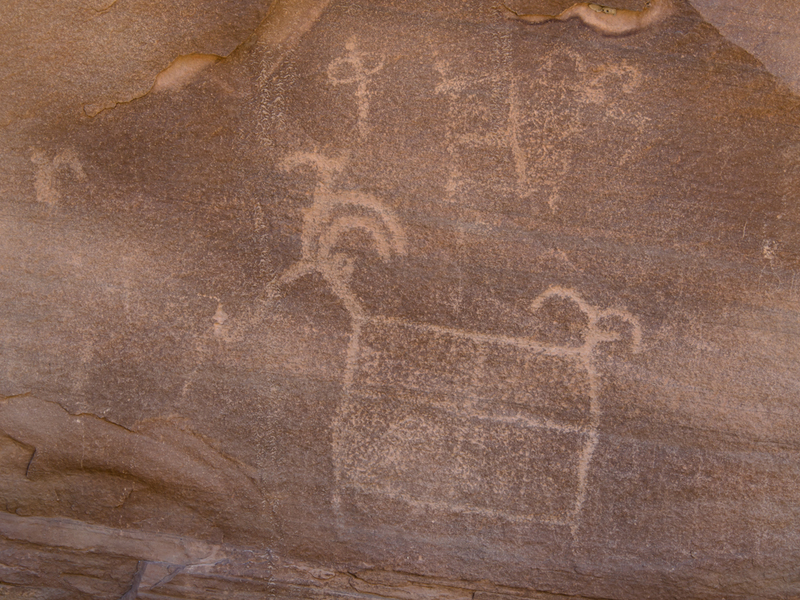 The sheep are stylized, of course, but the icon at the top (the oval with the line through it) is relatively common in rock art throughout the west. I have no idea what it symbolizes. 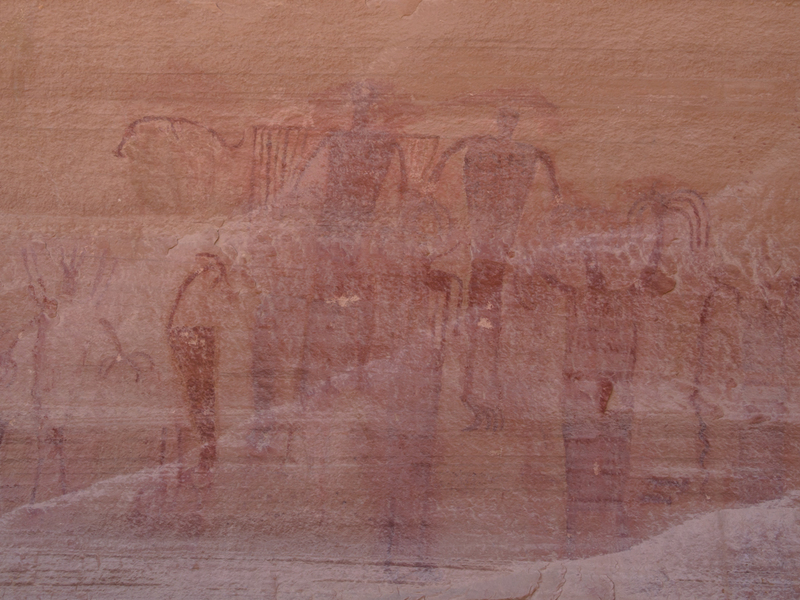 The second style of art is based on a pigment which is then applied to the rock wall using a brush made from pounded wood fibers. 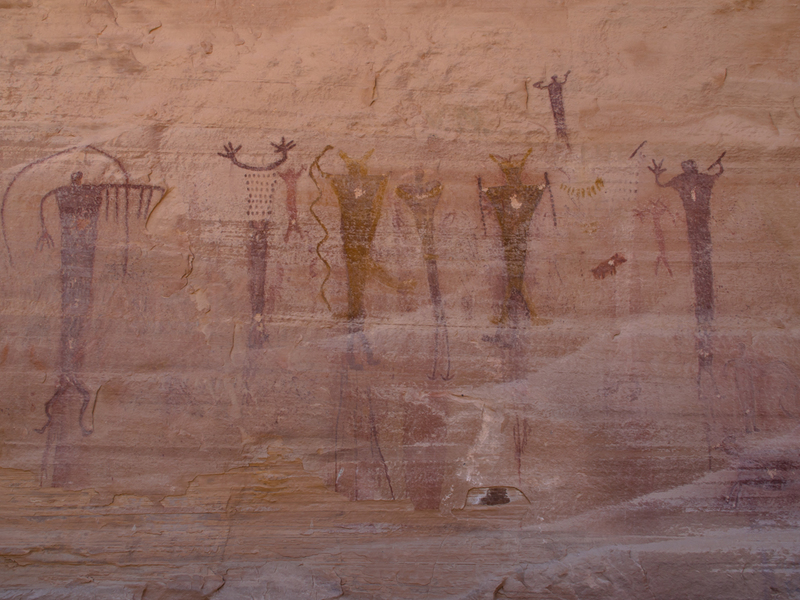 Several of the depictions were quite detailed. 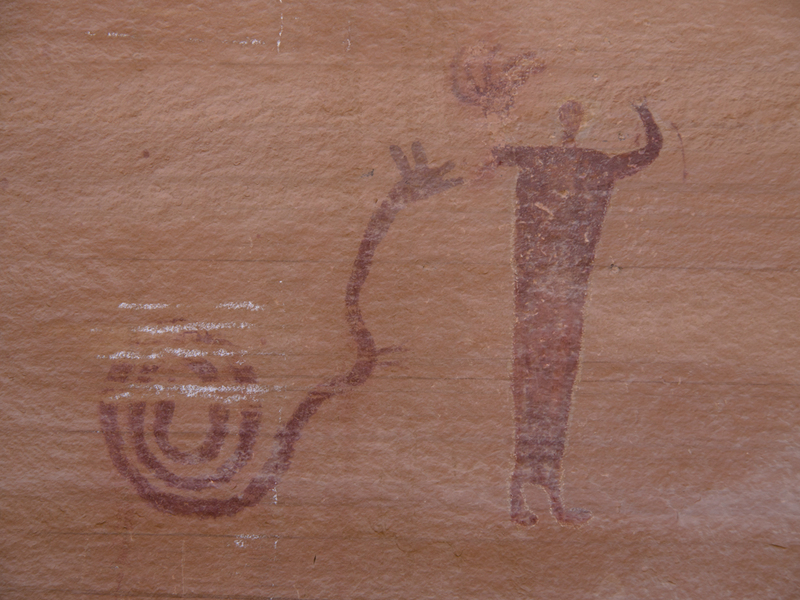 This stylized snake had ears or perhaps it was a representation of the viper's horns. This segment is starting to be damaged by water seepage. This panel was very busy with lots of detail. This panel was perhaps the most complex of the set. It is hard to imagine these NOT being related to some shamanistic ritual. Note the graffitti at the bottom: 1931. 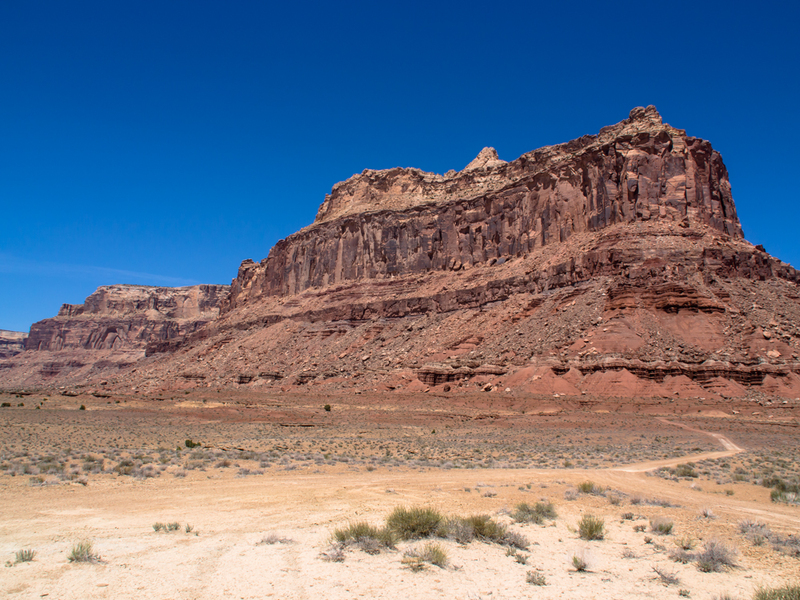 Continuing north up Buckhorn Draw, the canyon narrowed with high walls. Near the north end of Buckhorn Draw we passed this structure. 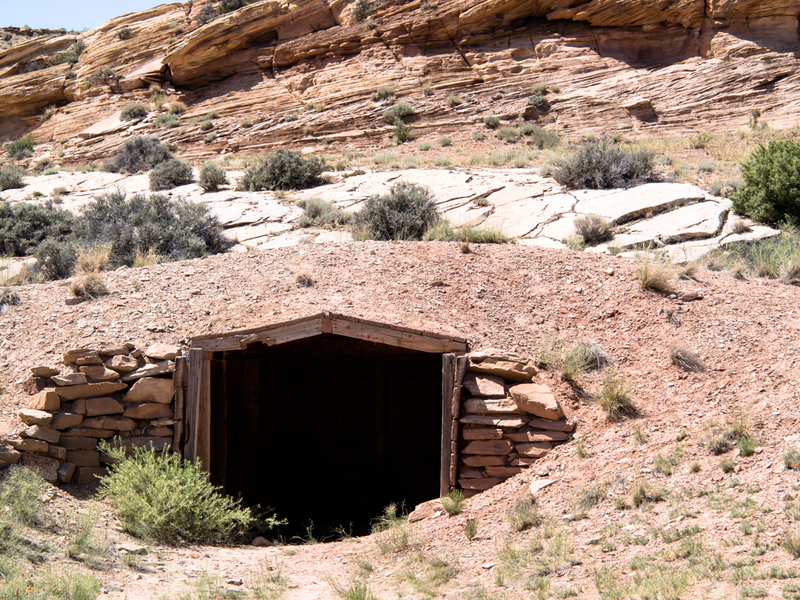 At first I thought it was a mine entrance, but inspection showed that it was likely a shelter. We traveled across the plateau and came to US highway 6 and then went north for a short bit until we hit a side road that followed the Price River. 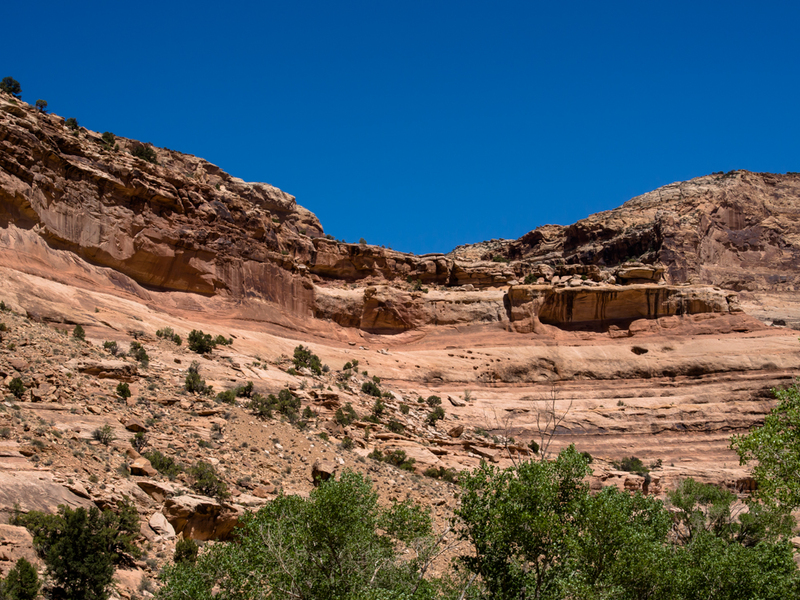 We were hoping for a shaded camp spot and after about 5 miles were rewarded with a sheltered spot with an awesome view of the Book Cliffs. This cliff is about a thousand feet high. Buckhorn Draw is well worth the long dirt road required to see it. The road was in great shape and was clearly a well-know attraction to the locals. But, vehicle traffic notwithstanding, the scenery was awesome. 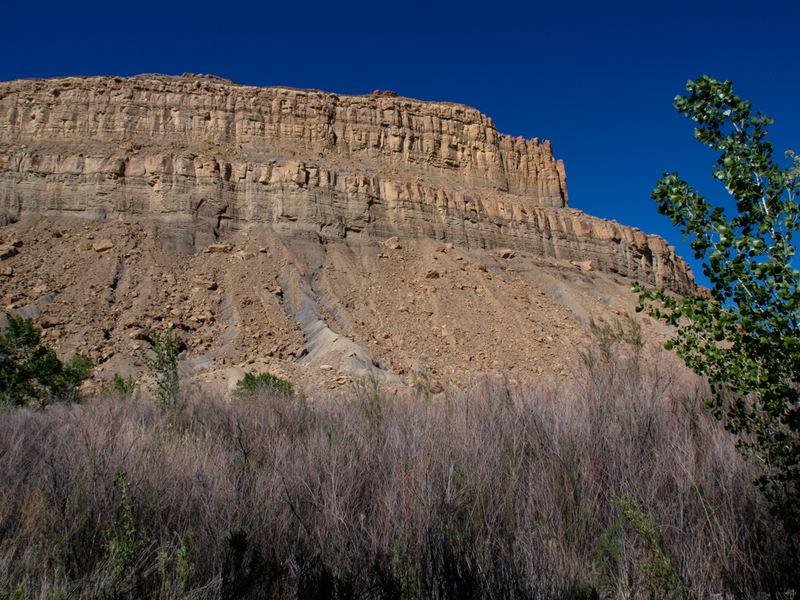 From the Book Cliffs, we headed north to Price, UT for a "laundry day" and a re-supply.